When he lectured on literature at Cornell University, Vladimir Nabokov referred to Jane Austen’s 1814 novel "Mansfield Park" as a "fairy tale," a term he did not use disparagingly. He also obliquely noted that none of its fairy-tale romantic doings would have been possible were its characters not somewhat affluent, and that the source of the money that affords the characters their modes of living is "cheap slave labor." The observation is a bracing one. But it’s true that the economic system that guaranteed the incomes of the moneyed characters in Austen’s world was a criminal one, even if Austen herself remained neutral on the topic. And it is uncomfortable to think that the template for the rom-com was built on...well, do I have to spell it out for you? The new movie "Belle," which claims, like so many such efforts, to be based on actual events, is a novel work in that it takes on a topic not regularly treated in period drama, that is, the necessarily fraught place of a free black woman in proper British society in the late 18th/early 19th centuries. 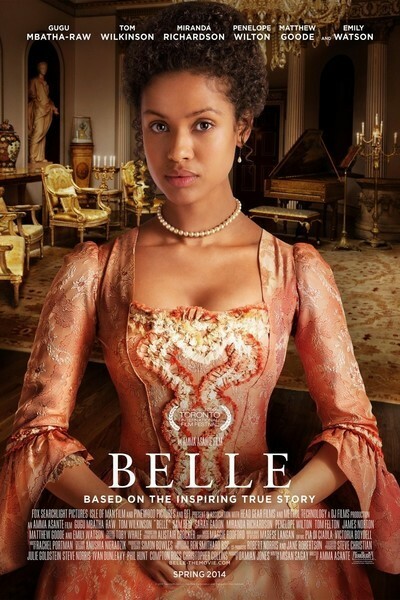 Directed by Amma Asante from a script by Misan Sagay, "Belle" tells the story of an illegitimate mulatto child, daughter of a Royal Navy man, who’s raised in affluence, lavishly educated, and rather condescendingly doted upon by the extended family her father foisted her upon. Once the girl, named Belle by her father but called Dido by her uncle and aunts, reaches adulthood (at which point she is incarnated by the lovely and capable young actress Gugu Mbatha-Raw), her marriage prospects seem...well, unusual. Good thing she’s got a guaranteed income, something her white not-exactly-sister Elizabeth (Sarah Gadon) does not, for reasons that a thorough reader of Jane Austen novels could probably guess at correctly. As it happens, Dido’s uncle Lord Mansfield (Tom Wilkinson) is a judge, and in the main part of the film’s story, he’s hearing a case involving a slave ship and the question of whether human beings can be insured like cargo. Dido hears about the case in dribs and drabs, and then in more detail from a neighbor, a passionate vicar’s son (Sam Reid) who’s under Lord Mansfield’s tutelage, at least until they have a violent disagreement on the main issue of the case. Dido’s consciousness grows, as does her attraction to the vicar’s son. But at the same time, Dido’s aunts, played by Emily Watson and Penelope Wilton, seek to steer Dido into an engagement with Oliver Ashford (James Norton), son of a very scheming grand dame (Miranda Richardson, of course) and younger brother to a bug-eyed bigoted quasi-rotter (Tom Felton, who seems not at all concerned by the fact that he’s lately being cast as a Draco Malfoy For All Seasons). The movie is intelligently written and well-acted, but it doesn’t sit all that comfortably between the two stools of Austenesque Romance and Socially Conscious Drama. Although director Asante herself is a woman of color her shooting style is as conventional as any veteran director you can, or can’t, name. Take the whole opening sequence, for instance, in which a sense of intrigue and drama is (putatively) built in a series of shots in which no faces are seen, merely feet and ankles taking strides, the backs of heads moving forward, hands opening carriage doors, and so on. All very stock, all very expected, at least if you’ve seen such montages as many times as I. So while "Belle" is of undeniable interest in some respects, its overall execution restricts it from being as engaging as it wants to be, and as wrenching as perhaps it ought.